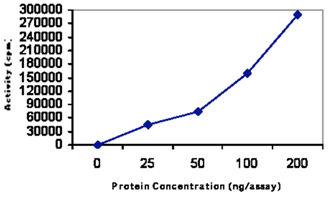 Source: Active recombinant human SGK-1 (truncated NT 60 aa) produced in Sf9 insect cells using an N-terminal GST-tag. Produced in a baculovirus expression system. Formulation: Liquid. In 50mM TRIS-HCl, pH 7.5, containing 150mM sodium chloride, 0.25mM DTT, 0.1mM EGTA, 0.1mM EDTA, 0.1mM PMSF, and 25% glycerol. 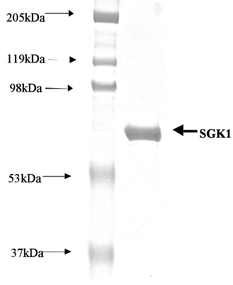 SDS-PAGE analysis of SGK-1 (truncated NT 60 aa) (human), (recombinant).